I have a problem with cooking rice. It is undoubtedly one of the easiest things to cook and equally easy to get wrong. We are a family of rice eaters. Think beautiful, fragrant, long-grain Basmati rice. We eat it with most things and on most days. Be it with a simple lentil dal or a spiced Indian curry, rice features heavily in our family’s diet. As I said, it is easy enough to cook and easier still to cook wrong. You would think after a decade of cooking rice I would have perfected the art by now. Far from it. There are days when I cook it in a pressure cooker and it turns lumpy. Some days I cook it on the hob and I have to watch it with hawk-eyes to make sure it doesn’t stick and burn. Most days I turn to the microwave where more often than not, I misjudge the amount of water and end up with half-cooked grains. J grins and bears it. The child will eat rice in whatever shape or form as long as it is a plate of rice. M is not so forgiving and has recently started to get vocal about the quality of rice being dished up every day. I need to cook perfect fluffy Basmati rice every day and I need a simple solution to do it. The traditional Indian method of ‘Dum’ or steam cooking is by far the best way of cooking not just rice, but meat and vegetables too. It works on the principle of letting food cook in its own steam by covering the cooking pot with a tight-fitting, weighted lid. Think ‘Dum Biryani’ or ‘Dum Aloo’ (spicy potatoes – recipes will follow at a later date when I actually measure things before chucking them in the saucepan). M sometimes gets inventive and uses weights (as in bicep curl weights) to weigh down the lid when he cooks lamb biryani. I can’t be bothered to faff around with stuff like that on a daily basis when the priority is to dish up a sumptuous meal with minimum effort. I may have found the perfect solution to my rice cooking dilemma. The Smart Steamer Lid combines the advantages of the more progressive and healthier cooking systems (waterless, steam, slow and pressure) into a single utensil. It promises to save time, money and effort – exactly what I ask of any new gadget in my kitchen. I have been putting the 20 inch Smart Steamer Lid through its paces to cook perfect fluffy rice on my ceramic hob in a 20 inch saucepan. I place washed rice in the pan and cover with double the quantity of tap water. Once the water comes to a boil, I cover the pan with The Smart Steamer Lid, before replacing the saucepan’s lid on top and lowering the heat to a minimum. I then set my kitchen timer to 12 minutes and can sit back and relax knowing the rice will not stick or burn as it is cooking on low heat and in minimum water. I come back to beautifully cooked, fluffy Basmati rice every time. One thing I have noticed. The Smart Steamer Lid does not fit snugly across my saucepan, so that some amount of steam does escape from the sides throughout the cooking process, even on the lowest heat setting. I am guessing this is due to a slight variation in saucepan sizing across brands. I might have to go and invest in another 20 inch saucepan to fit the Steamer Lid so that I get the most out of this innovative cooking process. 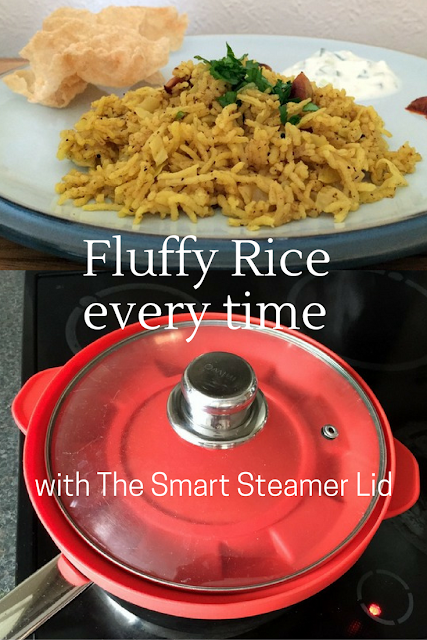 In the meantime, I intend to carry on using The Smart Steamer Lid (£12.97 RRP) to cook up delicious, and dare I say nutritious treats in my kitchen. Like this scrumptious Sabudana Khichdi (spicy tapioca sago) that is notoriously sticky and difficult to get fluffy. Next up, an attempt to cook Masala Chana and then Rajma (red kidney beans, not from a can). I will keep you posted on my culinary experiments. Just watch this space. Or why not subscribe to my blog via email so you don’t miss anything. I promise never to spam you. Disclosure: I was sent a review sample lid for the purpose of this post. All opinions are my own.